Peanut butter banana smoothie with spinach is a healthy breakfast or snack and full of wholesome ingredients! Great for getting kids to eat some greens! 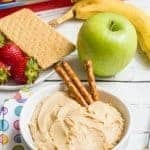 Enjoy on its own or add some fun toppings! Ah, Friday… how I love you so! We’ve had an unusually busy week here, in the form of social outings. I had a blogging friend dinner, my husband had a work dinner, we went to a wine/tapas event here in Charlotte and tonight is the fall festival celebration at my daughter’s elementary school. Whew! We’re not normally so cool! We’ve also got a Komen breast cancer walk tomorrow morning that we’re doing with the kids and a big group of friends (along with tens of thousands of other people 😂) and that’s always an uplifting way to start the weekend. And after that – CHILL TIME! I’ll be wiped! And now, calling all smoothie lovers! And also calling all those who are suspicious of smoothies, particularly the green smoothies, because this is about to change your mind! 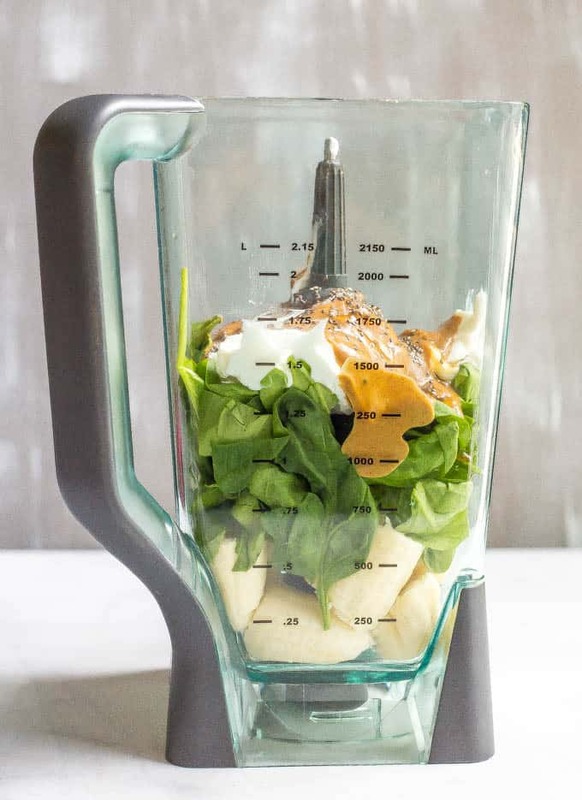 This peanut butter banana smoothie with spinach is a staple in our house. I also make a LOT of this whole wheat peanut butter banana bread. 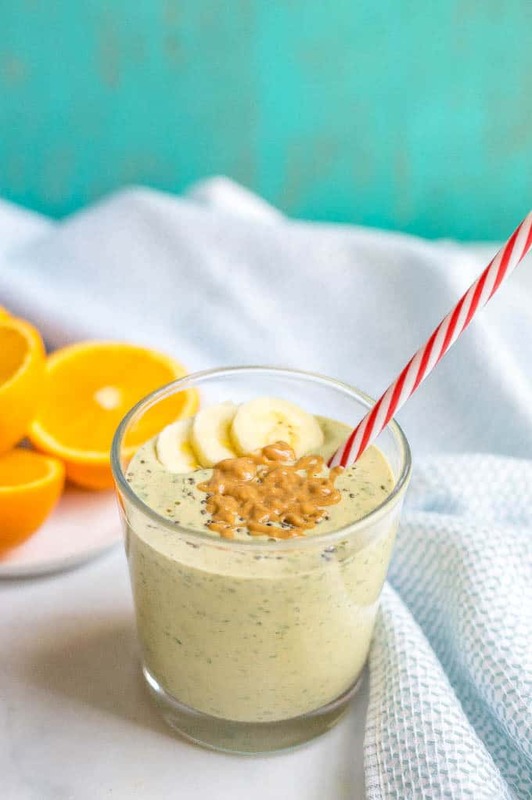 And this peanut butter banana smoothie with spinach is FULL of good stuff! 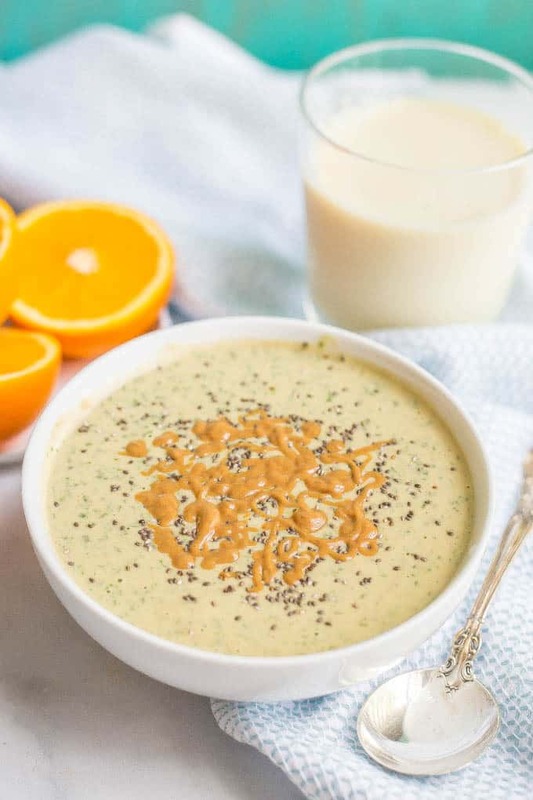 It’s loaded with a huge cup of spinach, plus bananas and peanut butter of course, plain Greek yogurt, some chia seeds for good measure, a splash of milk and honey to sweeten. 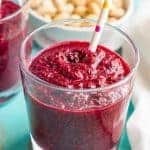 I usually make this smoothie for a healthy after-school snack — M requests it weekly these days! — but it also makes a great breakfast. It’s sure to fuel them for a busy morning! 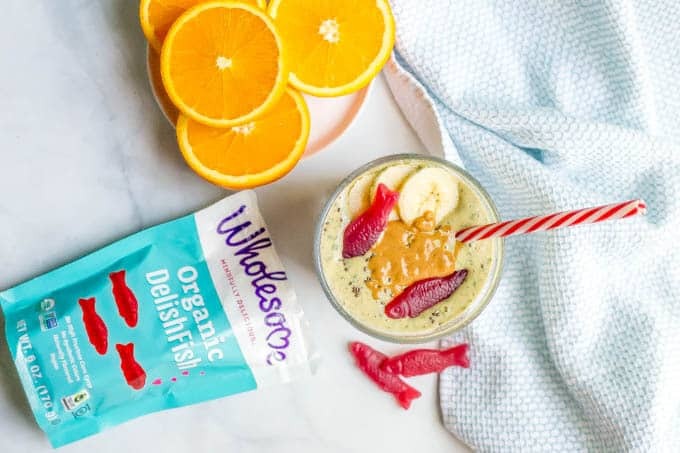 Well, I was as a kid – total candy freak – but since becoming an adult and getting into healthy eating and reading ingredient lists and trying to make wholesome choices for my family, well, candy went bye-bye. But as my kids get older, M (age 6) especially has been glued to the candy aisle. She always asks even though she knows I never say yes. 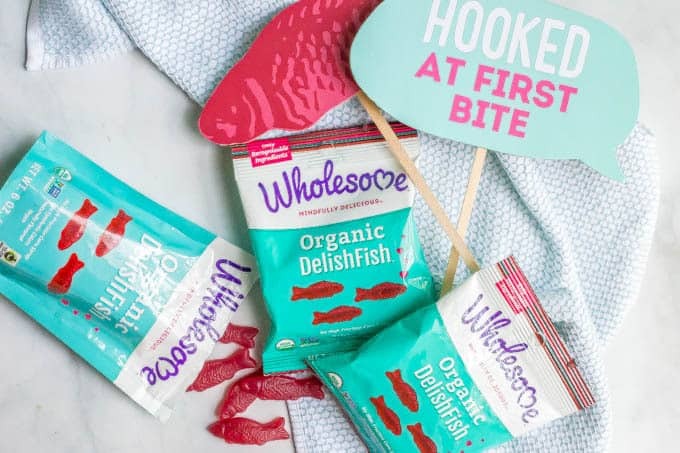 They are organic and non-GMO and made with real, recognizable ingredients. 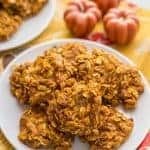 They’re gluten-free, vegan and kosher, too, so they’re a great candy option if you have dietary intolerances or special dietary needs. Basically, they are what I want if I’m going to offer my kids candy and they also taste amazing! So if you’re like me and looking for a better candy option for your kiddos, I hope you’ll give these a try. Wondering where to get them? Check out this store locator to find them near you. 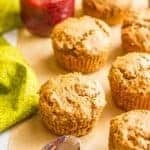 You’ll need to taste and adjust the amount you use for this recipe to get it to your desired level of sweetness. It will vary depending on how sweet your ripe bananas are and also how sweet you want it. 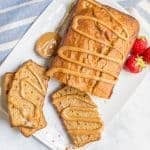 You could also substitute dates or maple syrup for the honey. Start with 1 pitted date or 1 teaspoon maple syrup and add more if you want to sweeten it up. The chia seeds are optional. I like adding them for some extra nutrition but you can skip them if you don’t have any. 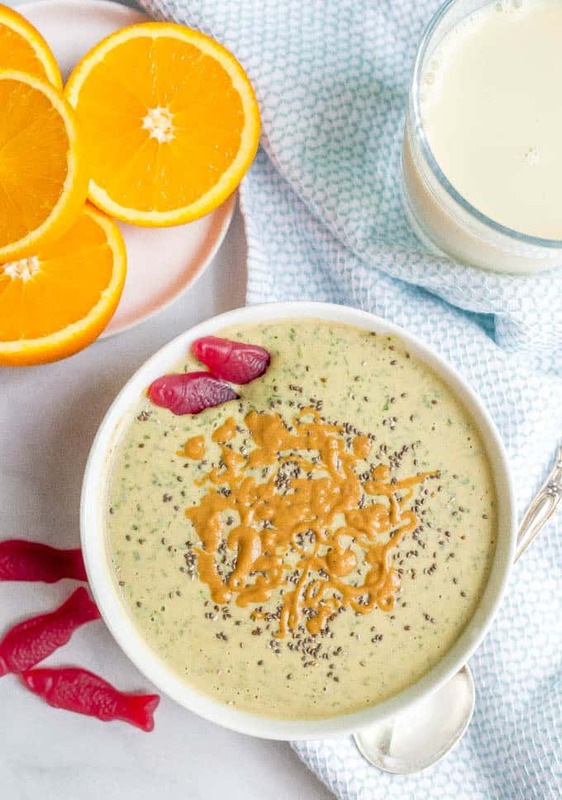 Peanut butter banana smoothie with spinach is a healthy breakfast or snack and full of wholesome ingredients! 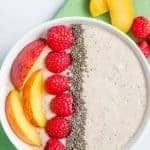 Add bananas, spinach, Greek yogurt, peanut butter and chia seeds to the blender and blend until smooth, scraping down the sides as necessary. Add milk to get the desired consistency and honey to sweeten, as needed. So happy to hear that Georgia!